He strides into the cafe we’ve agreed to meet at. Leggy, silver-tressed, with creamy skin lightly dusted with freckles, Harper’s president and publisher Rick MacArthur is a knock-out at 62 even in the rumpled khakis that glide over his still-boyish hips. When he collapses into a chair, he lays a Trapper Keeper on the table, murmuring that it’s ten times better than that [bleeped] phone nonsense. Announcing that this is his cheat day — “I learned recently this referred to food!” — he peruses the menu — “This menu’s paper quality is fantastic, isn’t it?” — before ordering a green juice, bananas Foster, and a double Scotch. He asks me when the guy who’s doing the interview is going to show. He is adorable. He asks again, using the words, “Chop chop.” He’s everything this interview said he’d be. 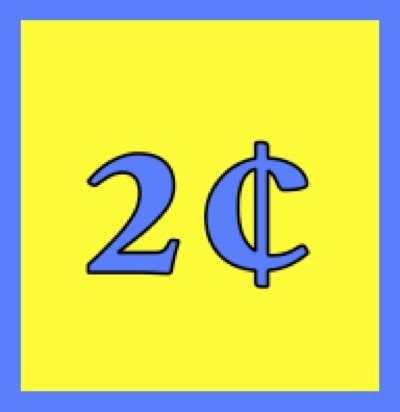 As the long-awaited second installment of Tales From the Crip’s series, Imaginary Interviews With People Who We Wish Were Imaginary, our new FuckAbility™ Research Council‘s Crip Carpet Correspondent, Janky Wheelchair, follows up on TryHarder™ Magazine’s recent take-down of John Hockenberry’s journaling essay, “Exile,” by devoting an entire episode of THE SIT-DOWN to publisher of the essay, Harper’s Rick MacArthur. The vivacious magnate talks nonstop about why paraplegics can’t sexually harass anyone; why he, a Francophile, is launching a Moi Aussi men’s movement to counter Me Too’s “Soviet-style” excesses; why paper is the future of Harper’s; and how everyone forgets how great John Hockenberry was in the film Coming Home. Keep reading for the unedited transcript of Janky Wheelchair’s exclusive hard-hitting interview with lively minx Rick MacArthur. 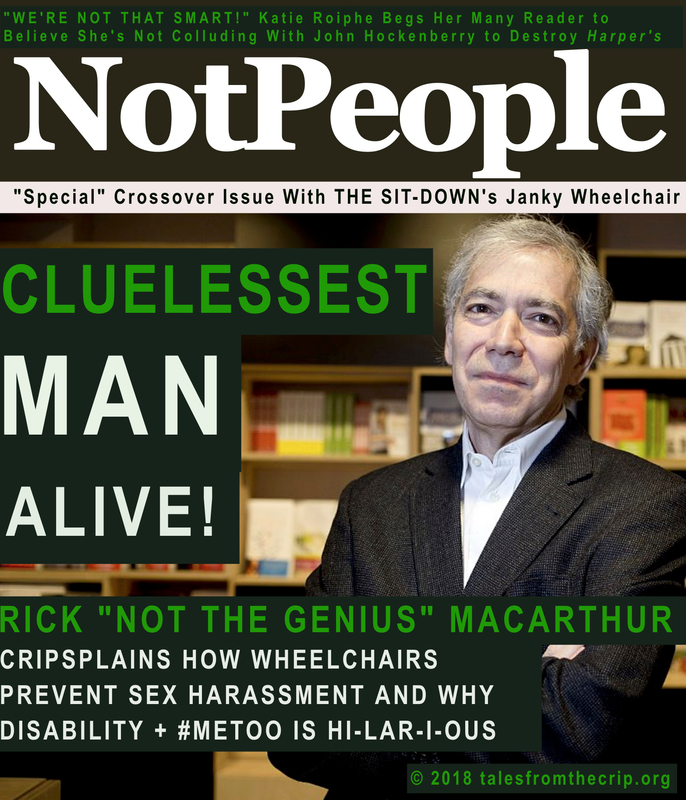 Flambee your bananas and keep the Scotch flowing because Harper’s RICK MACARTHUR is gracing the cover of NotPeople magazine as the CLUELESSEST MAN ALIVE! 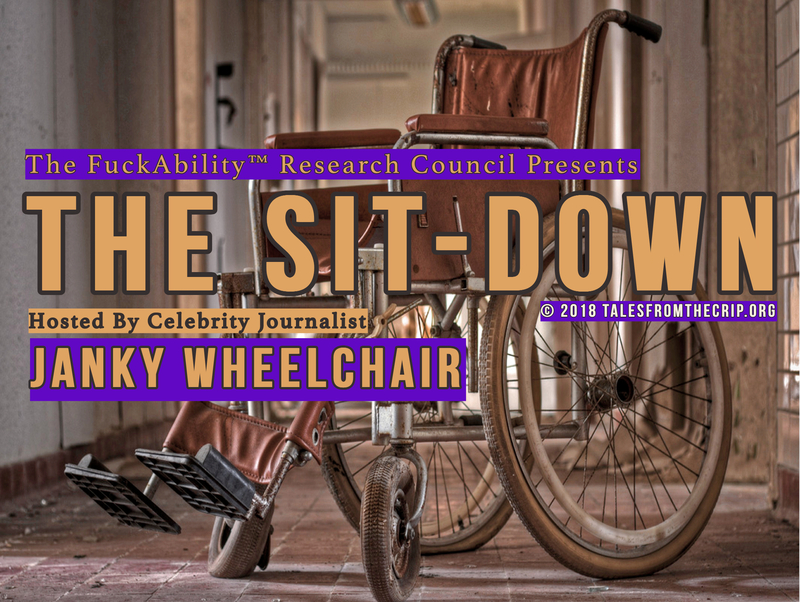 In which The Crip shares 2¢ takeaways from John Hockenberry’s 7,000-word essay about the loss of a high-status career identity that was purchased and published by a pretty damn high-status periodical.